SJ000291942 is an activator of the canonical bone morphogenetic proteins (BMP) signaling pathway. LDN-214117 is a selective inhibitor of the bone morphogenetic protein (BMP) type I receptor kinases with high selectivity for BMP versus TGF-β signaling, and low cytotoxicity. 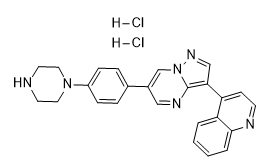 ML347(DN193719) is a highly selective ALK1/ALK2 inhibitor with IC50s of 46/32 nM; shows >300-fold selectivity for ALK2 vs. ALK3. 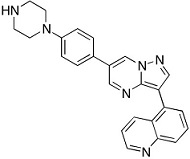 ITD-1 is an inducer of TGFβ type II receptor degradation-1, is a potent and highly selective TGFβ pathway inhibitor (IC50 = 0.85 μM). LDN-212854 is a novel BMP inhibitor that exhibits substantially greater selectivity for BMP versus the TGF-β type I receptors; possesses a bias towards ALK2(IC50=1.3 nM) versus ALK1 and ALK3 compared to other inhibitors.